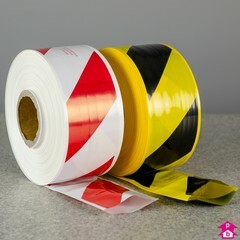 A range of warning tapes and sleeving to help alert pedestrians and motorists to potential hazards and danger. 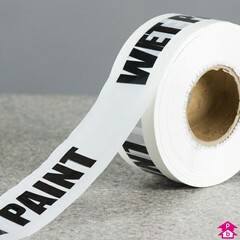 Including barrier tape for cordoning off an area and scaffold sleeving for covering and highlighting scaffolding. 5 Products. 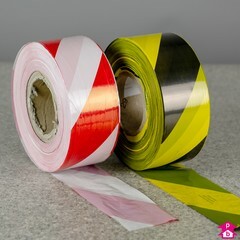 Barrier tape on a non-adhesive printed roll. The highly contrasting stripes serve as a clear visual warning for sectioned off areas. Suitable for a wide range of uses in various trades and services that include construction sites, factories, warehouses and emergency services. Available in red & white or high visibilty yellow & black. 1 Product. 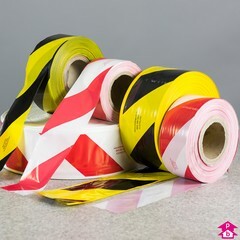 Non-adhesive warning tape to alert workers and the public of miscellaneous hazards and help cordon off and protect a designated area. 3 Products. Scaffolding sleeves are non-adhesive, highly visible warning sleeves in red & white or yellow & black, used to cover scaffolding poles to give a visual warning to passers-by. Manufactured from polythene and supplied as layflat tubing.